Plastic bags start out as fossil fuels and end up as deadly waste in landfills and the ocean. 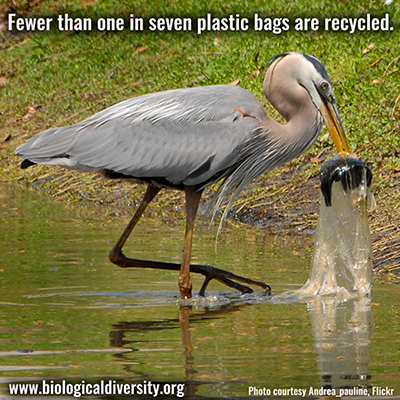 Birds often mistake shredded plastic bags for food, filling their stomachs with toxic debris. For hungry sea turtles, it's nearly impossible to distinguish between jellyfish and floating plastic shopping bags. Fish eat thousands of tons of plastic a year, transferring it up the food chain to bigger fish and marine mammals. Despite all of this, plastic bags are in almost every American home because retail giants continue to use them for nearly every purchase made in their stores. It takes 500 (or more) years for a plastic bag to degrade in a landfill. Unfortunately the bags don't break down completely but instead photo-degrade, becoming microplastics that absorb toxins and continue to pollute the environment. Learn more about how plastic pollution threatens wildlife.